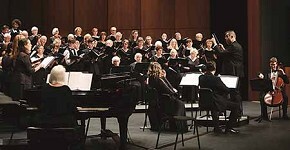 Venice Chorale To Perfom "Eins Deutsches Requiem"
On Tuesday, April 16, at 7pm, The Venice Chorale performs Johannes Brahms’ “Eins Deutsches Requiem" (A German Requiem)” with orchestra under the direction of Peter A. Madpak, at the Venice Performing Arts Center (VPAC,) One Indian Ave., Venice. Unlike most requiems, which offer prayers for the dead using Latin text from the traditional mass of the Roman Catholic Church, Brahms’ “German Requiem” is focused on offering comfort to the living and uses selected text from Luther’s translation of the Bible. The Venice Chorale’s Youth Chorus and Apprentice Chorus will also be performing selected pieces. Tickets: $20-$25, $5 students. Visit www.thevenicechorale.org or call the VPAC Box Office at 218•3779, Monday -Friday, 10am -2pm.